A few years ago, I convinced Simon to try roasted Brussels sprouts. They are one of my favourite vegetables, and that's my favourite way to cook them. He was skeptical, since he'd had some soggy, overcooked Brussels sprouts in the past. I took the tray out of the oven, he popped one in his mouth and said, "What do you know? I like Brussels sprouts." We've had them weekly in the fall and winter since. When I saw a recipe for roasted cabbage, I figured this would also be a winner in our house. I was making Slow Cooker Scalloped Potatoes, and my timing was off, so we ate the cabbage steaks as an appetizer, which is just as well, because it was a giant cabbage and the slice took up the whole plate. Anyway, if you like roasted Brussels sprouts, give this a try! Preheat oven to 375°F. Line a large baking sheet with aluminum foil and grease with canola oil spray. 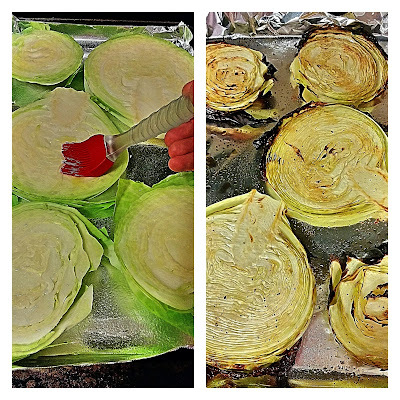 Slice the cabbage into 6 or 7 one inch thick pieces. Lay flat on the greased foil, and brush with olive oil. Season with garlic powder and pepper. Flip over and repeat on opposite sides. Roast for 20 to 25 minutes, until outside layer is crisp and centres are tender.